Pediatricians Say The Best Way To Beat The Flu Is To Get The Vaccine : Shots - Health News The American Academy of Pediatrics reminds us that shots — not a nasal spray — are the most effective way to protect kids 6 months and older against the flu. Doctors say don't delay getting the flu shot this year. The arrival of a new school year and cooler temperatures also means the arrival of flu vaccines in doctors' offices, pharmacies, clinics, work places, and school campuses. With flu season on its way, the American Academy of Pediatrics issued updated recommendations Monday for the flu vaccine — but without the needle-free option so many parents were hoping for. Parents and pediatricians both may be dismayed to hear that the FluMist nasal vaccine is once again not recommended. "It's a disappointment that it wasn't as effective as we thought it was going to be, and it's a disappointment that we don't get to offer a poke-free opportunity for the vaccine," says Dr. Wendy Sue Swanson, executive director of digital health at Seattle Children's Hospital. Scientists discovered last year that FluMist it did not protect against H1N1 infections in 2013-2014 and 2015-2016, and was weak against other strains. But that's not a reason to skip the vaccine altogether. Parents of children with needle phobia should be honest that the shot will hurt, but only briefly, she says. A quick tip: to help manage pain, distract your kid by telling them to pretend to blow out birthday candles at the moment they get the stick, Swanson says. It may also help to tell children old enough to understand that the vaccine's purpose is to stop them and people around them from getting very sick. "When you immunize your kid, you first and foremost protect them, you secondarily protect your family, and third, you protect those kids who can't get the shot, those older people who won't mount a great response to the vaccine and can get really sick when they're exposed, and those babies who are too young to be immunized," Swanson says. 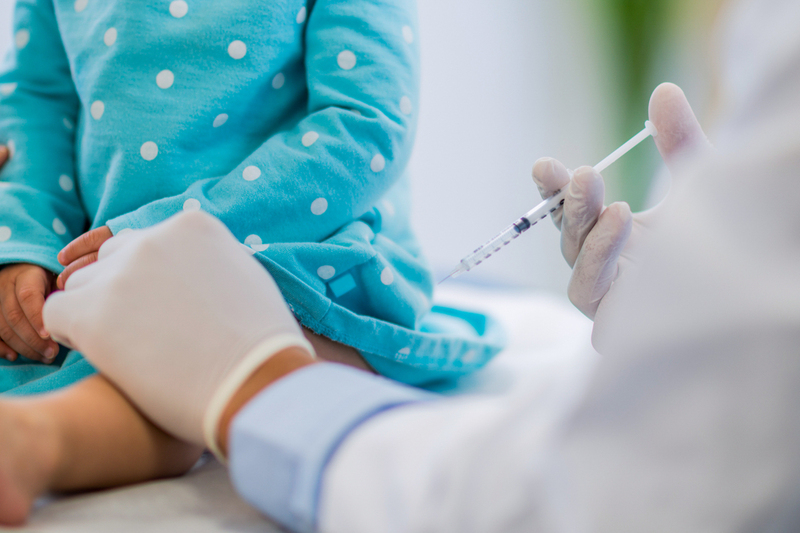 Parents need to understand that the influenza vaccine is just as important as other vaccines on the recommended immunization schedule, pediatricians say. "Flu vaccine is really an essential vaccine for children," says Henry H. Bernstein, professor of pediatrics at Hofstra Northwell School of Medicine in New York who helped write the recommendations. "The flu virus is really common, but it's totally unpredictable, and we know that it can cause serious complications, even in healthy children," he says. Past data have shown that the vaccine is 65 percent effective in preventing death from influenza. Only 26 percent of children who died from flu between 2010-2014 had received the vaccine. Last year, 104 children died from the flu, according to the Centers for Disease Control and Prevention. "That number may not seem that big to people, but about half of the kids who passed from influenza are healthy kids without underlying health conditions," Swanson says. "There are just certain cases where the virus takes hold of a body and spreads to serious and life-threatening pneumonia or even encephalitis," an inflammation of the brain and nerve tissue. Children most at risk for hospitalization from the flu are those with conditions like asthma, chronic lung disease and neurological or neuromuscular disorders, explains Mary Anne Jackson, chief of the pediatric infectious diseases section at Children's Mercy Hospitals & Clinics in Kansas City, Missouri. Parents should get their children vaccinated as soon as the vaccine is available in their area, Jackson, Swanson and Bernstein all emphasize. Even if it feels too early right now, there is no evidence that the vaccine's immunity wears off in children before the end of flu season, and there is no way to tell exactly when the flu will arrive in any particular community. "Influenza epidemics are inevitable," Jackson says. "They happen every year but they're unpredictable in five ways." No one can guarantee when the season will begin, how severe the disease will be, how long the season will last, which viruses will circulate, and how well the circulating strains and vaccine strains will match. It's pretty easy for kids to get the flu. "There's been data in the past that somewhere [between] 10 and 40 percent of kids are exposed to influenza every year because they exchange snot and cough on each other, and they're in close quarters with each other in the classroom," Swanson says. And then there are the close quarters of the holiday season. Children are contagious for several days before symptoms appear, and they shed the virus for up to 10 days, so family gatherings can be a prime time for exposure. The good thing about the vaccine is that it's never too late to get it. "If an unvaccinated child does get influenza, they should still get the vaccine afterward because there's no guarantee they won't catch another strain, Jackson says. The AAP recommends that all children ages 6 months and older be immunized against flu, but children getting the vaccine for the first time need two doses at least four weeks apart because the first dose merely primes the immune system. Any child who has previously gotten two flu vaccine doses, even during different years, only needs one dose per season from then on. Even kids with egg allergies are OK to get the shot. "Egg allergy is not a reason not to get the vaccine, and children with egg allergy do not need to go to an allergist to get the vaccine," Bernstein says. The AAP recommends that all pregnant women and those considering pregnancy receive the flu vaccine to protect the mothers against infection and allow them to pass on antibodies to their fetuses for up to the first six months of life. Women who are breastfeeding should also get immunized, but their children still need immunization. Not enough anti-flu antibodies exist in breastmilk to protect unvaccinated breastfed children. The AAP also recommends that all health care personnel get the vaccine, which includes any person working in a place that provides care to patients, from nursing homes to dentist offices to doctor's offices and clinics.